The regiment Oldenborske joins the army. 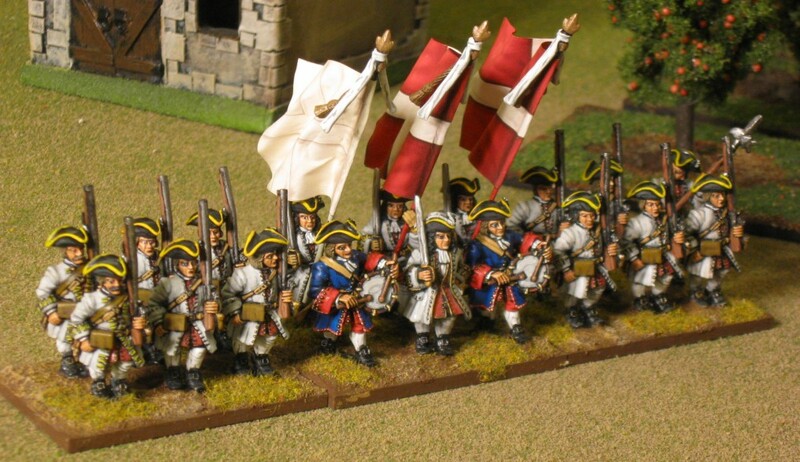 In my Ramillies order of battle these are named Holsten Sonderborg, which I believe maps to the regiment Oldenborske. According to Dan Schorr the facing for this regiment is muscus (moss) which should be a nutmeg color. When I read that I thought it would look pretty good. After painting it, I think that combination looks pretty boring…. The flags are from the League of Augsburg, toned down with washes to reduce the contrast, as per my previous post. The flags are beautiful and the artwork terrific, just to my taste the ground color looks better without as much contrast. You can see from the officer’s crimson sash that these folks were paid by the English rather than the Dutch. I’m really not sure that is how you write it…. Anyway, a new addition to my Allied order of battle. Figures from Front Rank. The flags are from Reiver castings. They are beautiful flags. I painted out the slogan written in French on one of the flags. They aren’t exactly like what Robert Hall has on his plate for the unit, but they are very close. I kind of obsess over getting colors correct. They were supposed to have straw yellow uniforms with red facings. It’s a great combination. I’m about half way through my next unit of Danes – Oldenborgske, which will put me over half way through the Danish foot contingent at Ramillies. I am caught up on putting flags on all the War of Spanish Succession units I have. Finally! When I started this project I didn’t know where I would get flags for everything. I think I’ve just about figured out how to do that now. To begin with, here’s a shot of the Danish cuirassiers I have completed so far. It’s half of the contingent that was at Ramillies. I lined them up as squadrons with space between each squadron – and that makes for a hard thing to photograph. But here it is. Not a great shot. But they look way better with flags now. These flags are from League of Augsburg. I love the cavalry flags they do. I am less excited about their infantry flags, but I’ll show you what I’ve done with them in a bit. Still, League of Augsburg makes an ever expanding range of flags. Their interests tend to run a bit earlier than the War of Spanish Succession. These Danish flags come from stuff they are doign for later. Barry and Clarence are great to deal with and it’s easy to order from their website. A couple of Dutch units I painted some time ago are Salisch, and Pallandt. Here is Salisch. White with red is a great color combination, don’t you think? Having flags for this unit completes the brigade that attacked up the “river” on the Allied left at Ramillies: Salisch, Slangenburg, and 2 battalions of Orange Friesland. The flags for Salisch and Pallandt both come from Iain at Flags of War. I am blown away by the quality of these flags! I wish he would do more Dutch regiments for Flanders. The artwork on these are just incredible, the quality of the flags are great (easy to blue together and position a bit before they set), and he is absolutely great to deal with. In my next blog post there will be flags from GMB Designs. I love GMB Designs flags. He does not do flags specifically for the War of Spanish Succession, but many flags for the French in this period are unchanged in the Seven Years War and he has an extensive collection of French Seven Years War flags. I also have some flags from Adolfo Ramos. He makes great flags as well, but only has a small number of flags suitable for the War of Spanish Succession. Back to the League of Augsburg flags. These flags are drawn with shadowing for waves in the flags depicted. I don’t really like that very much. For the cavalry flags, this is fine – it gives some texture to the flag and adds visual interest. I am extremely pleased with the Danish cavalry flags and am looking forward to adding some Dutch regiments as they offer a nice selection of Dutch cavalry flags. For the infantry, I decide to modify the flags to reduce the contrast in the effects. This is fairly simple to do. Before I cut out the flags I find a paint that is about the same tone as the midtone in the textured background. I then make up a heavy-ish wash with that paint. I don’t put the paint straight on but make a heavy-ish wash out of it (or an extremely thin mix of the paint, depending on how you look at it). I then go over that color on the flag and it works to diminish the contrast. Here is Danish regiment Prinz Karl with flags now. I probably should have done before and after photos, ,and then close-ups of the flags to show them off. They are great flags with great art work and I’m pleased that a little extra work tones down the contrast. You can still see the contrast and it gives a geat effect. Honestly I don’t know what I was thinking when I painted up this unit of dragoons. They are from Holstein-Gottorp and there was no way I was ever going to get a commercial flag for them. But I have a Robert Hall plate from which I was able to scan an image of the flag, process it, and produce a paper flag for these guys. So here they are. It came out alright I guess. It scanned in a little lighter than is in the plate but that seems fine. Front Rank figures as usual. WSS is heating up for me again. I saw a posting by Aly Morrison on LAF about how he had scanned a Robert Hall plate, put the image in photoshop and created a flag out of it. I don’t have photoshop and was thinking about getting it. But I decided to see whether I could grab an image from one of my Robert Hall ebooks before I plunked down the money for photoshop. I dropped the image into powerpoint and then realized I could mirror it, position it, and create a flag from it. Woohoo! Now, all those Dutch flags that no one makes but are in Robert Hall’s book, I can put on my units. This had to be one of the first units I painted. I used a gray that is much darker than I use now. Not sure they had grays that were that dark, but when I first started out I did not have good knowledge. But lat least they have flags now and the flags came out alright. Both of these units participated in the attack on the village of Ramillies. Front Rank figures. I played two games with these figures over the holiday break. My friend Allan and I played Ga Pa. With three other friends I tried Die Fighting. Die Fighting is an interesting game concept and it gives me a way to get my WSS figs on the table. I should have taken some pictures. I have painted another pair of units which I’ll post here soon. And I’ve added flags to some units and will post them also. You remember that thing I posted about painter’s block, about, um, 5 years ago???? I had finished four figures on the command stand – the standard bearers and drummers, and the rest of the figures were sitting primed on painting bottles on my desk. For 5 years. Wow. I’ve recently taken to finishing up long-started, long-unfinished projects on my desk. This was one of them. It’s funny how you get away from something and forget how much you enjoy it. I’ve come back to two long forgotten things recently – painting Front Rank WSS figures and painting Calpe Napoleonics. You can read about the latter shortly on my painting distractions blog. These are such a joy to paint. Interestingly, this is the one period where I don’t have tons of unpainted lead. I have the rest of the Danish foot for Ramillies, and a few cavalry and that’s it. I pulled out a unit of Danish cav that I have started and will finish those soon. Now all I have to do is get these lads out for a game. Here is both battalions of Gondrin.